Espresso machines in general are a 50/50 bet to work and function well. The more you spend, the better the chances will be that your espresso machine 1) works out of the box, or 2) works for more than a few months. The advice we can give to people in the market to replace an existing espresso machine or to buy their first one is to read the brand/model reviews and then to follow your gut. For instance, if you read nothing but rave reviews for an espresso machine that costs less than $100, be careful. The reviews could be written by company employees or friends. When you get to the models that cost between $100-$250, you still must be careful. Make sure there are plenty of reviews and read the ones that do not give high praise because those comments are the worst that can probably go wrong. Espresso machines that cost upwards of $250 are probably a safer bet but ensure that the frame of the structure is die-cast steel and not made of plastic. Futher, make sure all moving parts are steel and not plastic. Believe us, at some point, some plastic part will fail, break or fall off between year 1 and 2. You may justify paying for a cheaper model by calculating the savings in $3 coffee Starbucks that you will no longer have to pay for. That’s fair. If you want more convenience, less headaches and money savings, though, pay more for a better model. You will make your money back and then some. Our orginal espresso machine was a Krups model combination espresso and coffee machine, less than $200 and made of plastic. Even the moving parts, more specifically, the rotating knob that triggered the heat pot on the espresso side, was made of plastic. All worked well for about 1 1/2 years then the steamer broke despite careful daily attention to cleaning the spout and airhole. Every month, we would also run clean water through the machine just to cleanse it of potential harmful impurities (we used filtered water to brew our espressos). A few months later, the plastic rotating knob broke off and each day thereafter became a challenge in finding that right position for the knob to trigger the heat pot. Finally, it got too unwieldy and precious minutes, 5 minutes, 10 minutes, 15 minutes, would tick off before we could get it to work properly. 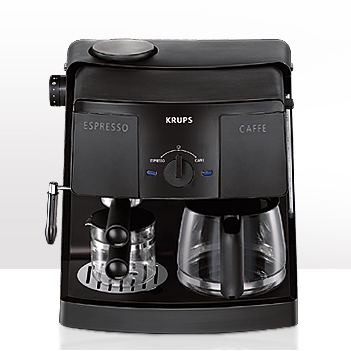 However, for 2 years, we had the Krups espresso/coffee machine. We saved about $1,500 over those two years including the cost of coffee we would have purchased from Starbucks in the meanwhile and the cost of espresso beans needed for our espressos. This time around we paid $399 (on sale from $499) for a Breville 800ESXL die-cast steel espresso maker machine. All parts are steel. The only moving parts are the switch from espresso maker to steamer on the front face and the steamer. The plastic cover on the Krups espresso machine steamer broke off eventually. The Breville espresso maker’s brew head is elevated so larger coffee cups can fit underneath. The filter holder that fits into the brew head comes with 1 cup and 2 cup filters and a tamping spoon. Breville also provides a small steel handled pot in which milk can be steamed. Another nice convenience is that with one push of the button, the steamer becomes a hot water dispenser for hot chocolate, tea or any beverage that requries hot water. In addition, a large removable 2.3 quart (2.2 liter) water tank allows for almost continuous espresso making. We’ve only had the Breville espresso maker for a day but we read review after review. The espresso was delicious. We’ll see how the machine holds up over time. Based on the reviews, we should get more than 2 years out of it. We bought it from Macy’s but could have purchased it online. 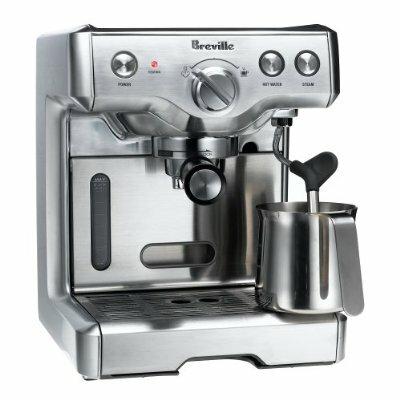 Macy’s covers replacements and maintenance for the first 6 months while Breville provides a one year warranty. In case of problems, we’d much prefer to return it to the store rather than experience the nuisance and inconvenience of shipping a product back to people we don’t know and will never see. Although it’s been a day, the point is that you get what you pay for. It seems that no matter what brand or price point we were comfortable meeting, we would save money because Starbucks lattes are so expensive. But, we really wanted to save more money and not deal with the inconvenience of breakable plastic parts. We’ll see how the Breville espresso maker does in these next few months. I have this machine; I bought it almost 3 years ago and I am very happy with my purchase (I got it at Bed Bath and Beyond). I use it twice a day, every day, and it has never given me any problems–unlike the previous 2 machines I had, the first a cheap “starter” steam model and the other a Delonghi base pump model, and both of which only lasted a year apiece. According to my friends and the guests I entertain, the espresso itself is very good–the machine produces excellent crema–and the espresso drinks I make are on par or surpass Starbucks and the like. I have become quite the pro at frothing milk with the frothing wand, although I don’t use the metal sleeve that comes with the machine and covers the wand; it prevents me from making that silky “microbubble” froth that is the hallmark of barista-level cappuccino or latte. One thing I don’t like about this machine is that after you brew a shot, the grounds in the filter come out sopping wet due to the design of it, so it’s a bit messy to set up for the next shot, as the grounds do not come out in a convient, hard “puck” like in other machines. Steaming your milk after pulling your shot helps to mitigate the moisture left in the grounds, so that is now my routine. I cannot stress this enough; TAKE GOOD CARE OF YOUR MACHINE! That means using filtered water ONLY in your machine; running water through the empty filter and brew head after every use, running hot water for a good 5 seconds through the wand right after you steam your milk; and of course, wiping down everything with a clean damp cloth when you’re done. The extra 2 minutes it takes to do all of these things have made all the difference in giving me years of hassle-free, excellent coffee pleasure.